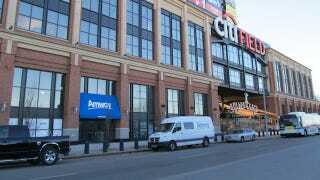 Lost in all of the hullabaloo about the New York Mets' tone deaf decision to lease a Citi Field storefront to Amway was any kind of explanation regarding what exactly is inside of an Amway store. What use does a company that makes its profits via the Sisyphean efforts of Independent Business Owners have for a retail location? Luckily, Howard Megdal of Sports On Earth was willing to take a field trip to the Citi Field Amway, and he found himself in a very strange place. In addition to the juice bar that doesn't sell juice, Megdal was shown a demonstration of a weird skincare diagnostic product (F.A.C.E.S. Artistry Skincare Recommender), and a cleaning product that can remove wine stains from dollar bills. Neat! Three iPads sat along the far wall; a potential consumer had two choices. If I wanted one of the few products in the retail room, I could simply go onto Amway.com, fully fill out a form with all of my information and then make a purchase. Or, if the product wasn't in the retail room, I would still need to fill out all of my information, which would then be sent to an I.B.O., who would then complete the purchase. When I asked Nancy if anyone had purchased anything yet in the retail room (officially called the Product and Registration Room), I was told that no one had. Not a single product? No. Be sure to check out the whole story. And get ready to enjoy your weird store, Mets fans.